Jay Sean’s “Hit the Lights,” Mixed by Miles Walker with UAD-2 Powered Plug-Ins. Miles Walker mixes and produces records for some of today&apos;s most successful pop acts. 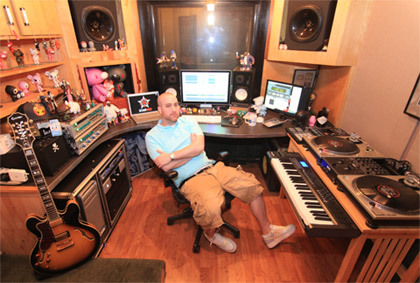 Getting his start at Silent Sound Studios in Atlanta, GA, Miles worked alongside songwriter and producer Sean Garrett for acts like Beyonce, Usher, Enrique Iglesias, and the Pussycat Dolls. He moved on to work closely with the amazing production duo Stargate, with whom he mixed #1 records from Rihanna, Katy Perry, Wiz Khalifa, and more. Still based in Atlanta, Miles works from his studio at Parhelion Recording using a UAD-2 QUAD DSP Accelerator — the perfect pop vocal production setup for many of today&apos;s hottest acts. Hey everyone, I&apos;m going to be looking at a mix I did for Cash Money artist Jay Sean called “Hit the Lights,” one of the lead singles off his new upcoming album, Freeze Time. I love Universal Audio’s “Producer&apos;s Corner” articles, and wanted to share some of the vocal mixing techniques and ideas I use when approaching a song for an album. As background, this record was Jay Sean&apos;s return to the radio after his mega-hit “Down,” so I wanted to pull out all the stops and really make it work for club and radio. The record was produced by OFM, consisting of Jeremy Skaller and Bobby Bass, the same amazing production duo that whipped up “Down” for Jay Sean a few years back. With all these elements in mind, I set out to maintain a great clean sound on Jay&apos;s vocals, while putting in some spicy mix effects to create the ear candy that I love in today&apos;s pop records. I&apos;m mostly going to focus on the vocal settings and approach here, though I can tell you that the rhythm elements of the track would not have been bumping without some help from the UAD-2 QUAD card as well. Want it on your iPod? Here&apos;s a link to buy it off iTunes! Gotta start with the biggest part of any song—the hook! This production of the song has a big impact at the hook, and the vocal is no exception. After working out the blend and clarity of the vocal, I felt the best thing to do is work on the space around the vocals to really bring them to life. Set up on a few different sends (for automation purposes), I had the great EMT® 140 Classic Plate Reverberator Plug-In being fed from the various vocal subgroups. In addition to that, I had the EP-34 Tape Echo plug-in doing a distorted quarter note delay on the word “lights.” Also, the main phrase of the hook was being sent to an aux with the Cooper Time Cube Mk II with a nice stereo doubling setting on it. Full disclosure, I still have some UAD EQ and compression treatments on the vocals, but I really wanted to show how the sense of space and echo is lost without these in the mix. The accent on “lights” becomes a driving force for the rhythm and groove, which is huge. The gritty degeneration sound of the EP-34 is great for making a different type of accent instead of a straight ahead clean delay. The stereo width from the Time Cube on certain phrases of the hook really impact the title lyric, which is something I always try to think about during a mix. I think that any special lyrics should have a special effect to really impact the listener. The EMT plate glues it all together, adding a nice tail of space on the phrases and a warmer EQ curve, ducking down some of the very high end. Altogether there is a “wet” feeling of effects, but when it&apos;s against the track it doesn&apos;t seem excessive, in my opinion. With a great vocal performance like Jay Sean’s, I felt like the verse just needed some shining and presence, so I called up some of my favorite EQs and compressors from the UAD line to give it just what it needed to be clear and full of life. The verse is split into eight bar phrases, with background vocals throughout. I opted for a bit of distortion on the first bar to give it a grimy feel right when the beat drops from the intro. That also created an opportunity to come in really clean and strong on the second bar. 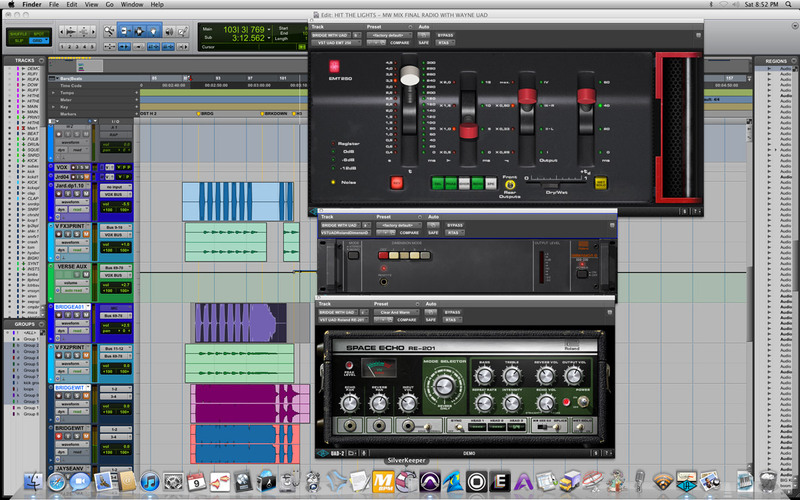 Using EQ choices from the Trident® A-Range Classic Console EQ Plug-In, the Pultec® Pro EQ Plug-In, and the SSL E Channel Strip Plug-In, I was able to bring out the detail in Jay&apos;s vocal and let it tell its own story. I also used the Teletronix® LA-2A Classic Leveling Amplifier Plug-In to give a nice even sound to the verse leads, and to keep the backgrounds from jumping out too much. After putting the distortion effect on the lead, it thinned out the vocal too much, so I added in a wide "U Curve" with the Pultec plug-in at 100 Hz to give it some nice body. The clean leads, as well as the backgrounds on the second bars had the Trident A-Range with a little high pass engaged, dipping out at 80 Hz and slightly dipping at 1k, and adding a nice shine up at 12k. I really love the sound of the Trident up in that airy 12k-15kHz range. It&apos;s very smooth and can be added to make a vocal feel really shiny, but not harsh. 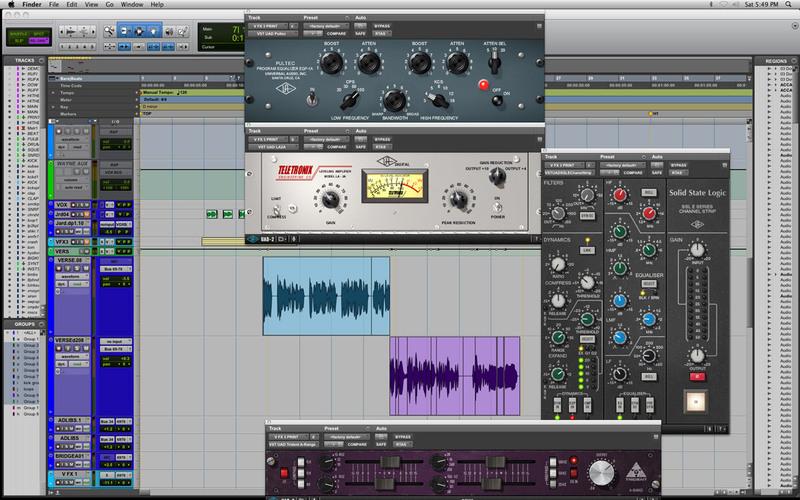 All the leads were summed to an Aux send that added the LA-2A plug-in to even it out, followed by the SSL E Channel Strip to sculpt it further. While I do have a soft expander setting going in the dynamics, I mainly use the filters and EQ curves subtractively on the SSL E Channel. Its fully parametric settings are great at dialing in and cutting out problem frequencies. I&apos;m also a fan of the E Series high-end shelf, and often top off a vocal group with some of that. I will typically have my vocals going to various sub groups (leads, background vocals, hook, bridge), which is helpful for summed signal EQing and compression as well as easier automation and sends control. As you can hear, both versions have the reverbs and delay settings mentioned previously. As you see from the picture, I actually ended up reprinting the Space Echo effect as a separate audio clip. Jay Sean liked it, and it&apos;s nice to be able to give the artist separate control of the effect — for when they are performing a new live lead vocal, on television or at live performances. It also allows me to easily send it to the new reverb that I created for this section, a nice longer space from the EMT 250. Calling All Producers! Have you got a standout original music mix that you want to share with the world in a future edition of "Producer&apos;s Corner"? 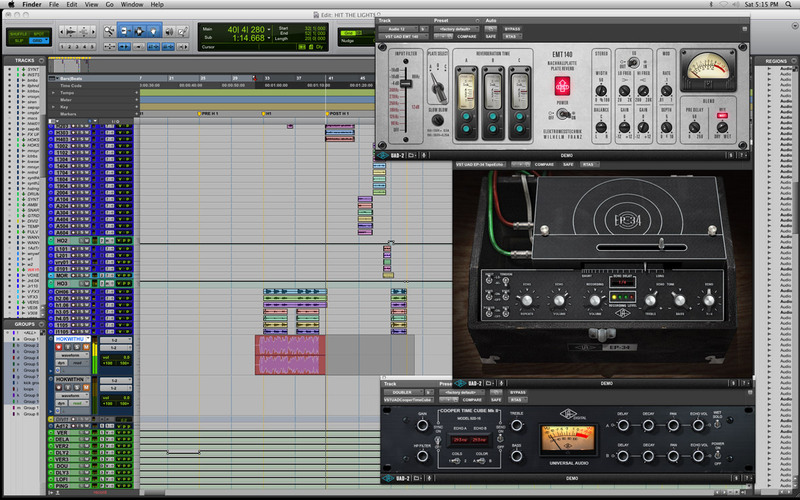 Drop us a line at artists@uaudio.com with a link to a high-resolution mp3 (320bps) for consideration. Everything you wanted to know about UA's Unison™ technology but were afraid to ask. Watch producer/drummer Joey Waronker as he tracks The New Pornographers' A.C. Newman with Apollo interfaces and its included Realtime Analog Classics Bundle. In this video, watch producer/engineer Fab Dupont (Jennifer Lopez, Mark Ronson) install a multi-unit Apollo system and show you how to easily set it up with your DAW and record with UAD plug-ins in Console 2.0. Featuring the band DEDE.